While I was sitting on my sofa in front of the woodstove, something caught my eye. Along the cliff at the water's edge a small bird was bobbing along and diving in and out of the water. A few minutes later, it came over onto the cabin deck. A Song Sparrow visits the cabin front porch in mid-January. I tossed a small handful of birdseed next to the picnic table to see what would happen. He stuck around to eat lots of seeds before taking off. I wasn't sure what kind of bird it was so I Googled likely varieties, but none of the pictures looked exactly right. Then I discovered WhatBird.com. I used the bird identification tool and narrowed it down. Then I discovered their forum section and joined. Within a day, site experts identified my little guy as a northwestern subspecies of Song Sparrow. This subspecies tends to be darker than its southern relatives. Look at just a square metre of the forest floor you will find a multitude of plants crowding together for nutrients, moisture, sunlight, and protection from the elements. Up on the cliff under the canopy of cedars and firs I found this clump of Cladonia bellidiflora also known as Floral Pixie and Cup Lichen. Lichens are part plant, and part fungi. They are algae or cyanobacteria and fungus living as a symbiotic, composite organism. That makes them a bit tricky to classify. Cladonia bellidiflora (Floral Pixie) in the middle. I found these in mid-March before the bright red fruiting bodies appeared on top. In addition to British Columbia, they can also be found in Britain and many other parts of the world. Bunchberry (Cornus canadensis) is also known as Dwarf Dogwood. When you look at the flower you can see why. I’ve seen Bunchberry in Newfoundland and Coastal BC. It also ranges from Alaska to New Mexico. That’s a pretty wide distribution. Bunchberry likes moist conditions such as forest floors, meadows, bogs, and rotting logs and stumps. I found my example on an overgrown logging road near a cut caused by winter rains and spring runoff. It’s a perennial low growing plant that creates extensive and dense mats. Four to seven green leaves are arranged in a circular cluster and remain mainly evergreen. In the middle is a flower surrounded by four white bracts (modified leaves). References: Plants of Coastal British Columbia by Jim Pojar and Andy MacKinnon (Lone Pine Publishing, 1994) and Wild Berries of the Pacific Northwest by J.E. Underhill (Hancock House Publishers, 1974). 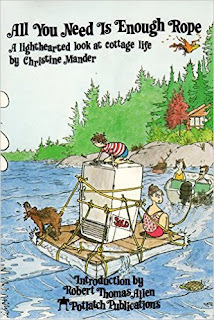 All You Need Is Enough Rope: A lighthearted look at cottage life by Christine Mander and illustrated (humorously in "doodles") by Michael Eddenden is all that her title promises. 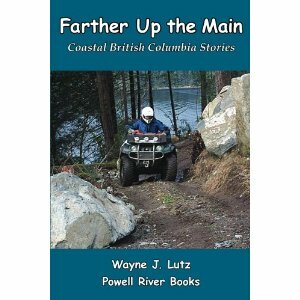 It was published by Potlatch Publications in 1981 and is only available as a used print book. I found mine at a favourite used bookstore in Bellingham WA, Cozy Corner Books and Coffee. If you are in the local area, I'll be turning my copy back in for a credit for new things to read. Ask Chris, the owner, if it's still available. You can also check online. Amazon offers a few used copies. The book is set in cottage country in Canada. What caught my eye was the title and cover image about transporting a refrigerator on a wobbly looking raft. At our float cabin on Powell Lake we always are trying to get things up and down the lake, including a large refrigerator of our own. 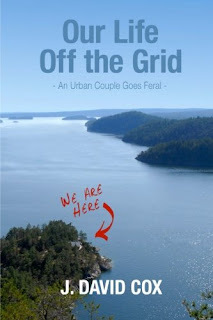 I knew this author had experienced some of the same things we have learning to live off the grid. The book began with finding their property, building a cabin, enjoying their cabin and cottage country life, and then finally having to let their beloved cabin Outspan go. Times and lives change. I dread the thought of that ever happening to us. There are may funny things that happen along the way. Of course there's the delivery of large appliances like the refrigerator, getting caught skinny dipping when you think you're far from prying eyes, boating woes (been there, done that), and a hiking misadventure. And throughout, Michael Eddenden's "doodles" keop the humor building. I've joined several homesteading memes. I get to share and receive lots of good ideas. Here's a recipe I found at Happiness is Homemade at A Peak into My Paradise. Cinnamon Swirl Pancakes links back Christina's at it's a keeper.com via Frugal Antics of a Harried Homemaker. Make pancake batter using your favorite recipe or mix. 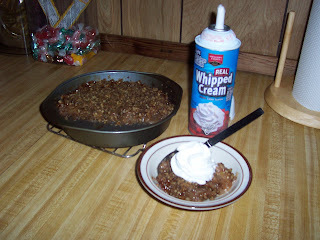 The recipe says: In a microwave safe bowl, combine the butter, brown sugar, and cinnamon until smooth. Microwave on high for 10 second increments until it is soft and can be squeezed through a pastry bag. I don't have a microwave so I melted the butter in a pan, added the sugar and cinnamon, and cooked it on low until dissolved. I put the mixture in a Ziploc bag and snipped off the corner. The recipe says: Pour the pancake batter onto a hot griddle. Squeeze the cinnamon mixture over the batter in a swirl shape. When pancakes are lightly browned, flip and cook until done. Clean all of the sugar out of the pan before starting a second batch. The recipe says: Using a hand mixer blend until smooth. Pour the icing into another pastry or Ziploc bag. Squeeze it over the cooked pancakes. I don't have a hand mixer either, so I used a sturdy whisk and it blended just fine. With bacon and coffee it made a hearty cabin breakfast for Wayne and me. Thanks to MB from Small City Scenes of Stanwood I'm trying a new meme today called Outdoor Wednesday on A Southern Daydreamer. Living in the middle of nature I have tons of outdoor pictures. Here of my favourite view, Goat Island in front of our cabin. First snow on Goat Island in Powell Lake, BC. 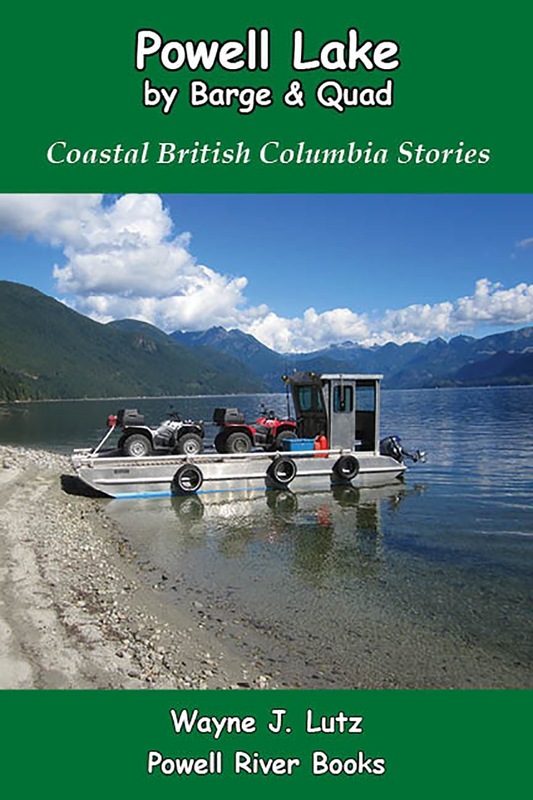 Kick off your new year by reading a book about leaving the big city behind and "going feral" on a small island in Coastal British Columbia. Our Life Off the Grid: An Urban Couple Goes Feral by J. David Cox is such a book. 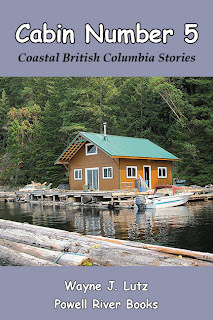 David and his wife Sal left their urban life in the Vancouver, BC, area, and built a cabin home on land they owned on a remote island up the coast. I learned about this book from another author's blog. Chris Czajkowski wrote a review at her blog Wilderness Dweller. Chris is the author of many off the grid and wilderness books including And the River Still Sings. I immediately bought David's book in Kindle format and read it cover to cover (so to speak) in a few days. 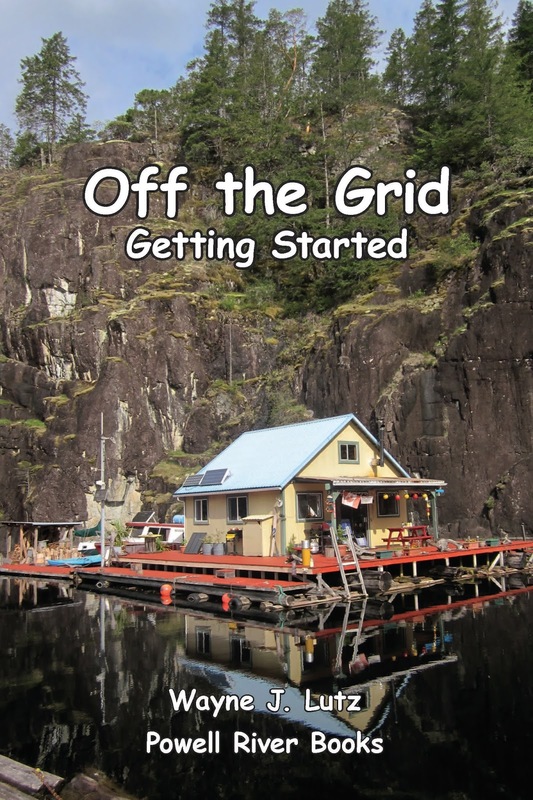 David and Sal embarked on their off the grid living adventure when they were in their 50s. Over a ten year period, they built their new home from the ground up. They had some help along the way, but by and large their cabin and other amenities are self made. David is very inventive in developing applications that make living far from the city easier. They've created an island home that is comfortable, they have friends in the area, and occasional shopping in the nearest town (even if the boat trips can be harrowing). Read the book to get the details. It's fact filled, yet written in a humorous, page turner manner. But be careful, it may make you want to follow in their feral footsteps. David and Sal are living their dream. I can relate to that. They live off the grid 100% of the year. Wayne and I are at our float cabin home about 75% of the year in all seasons. I could probably go for 100% except we still enjoy travel to find warmer sunshine during the winter. Want to know more about David and Sal's lifestyle? Here are a few links listed on their blog.